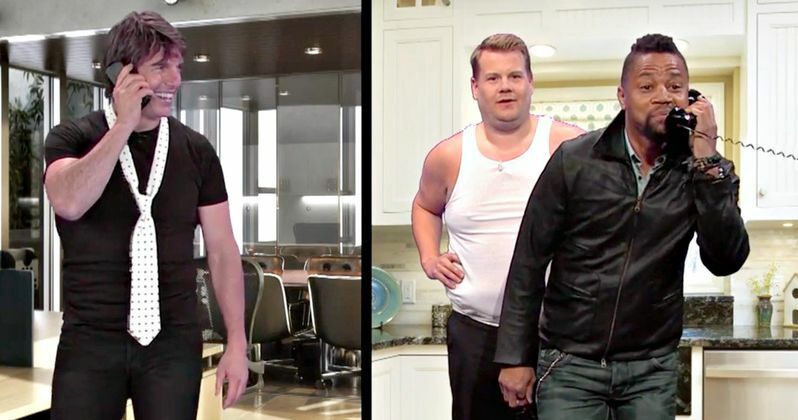 James Corden has gained quite a reputation as being the king of late night viral videos, and for good reason. Almost everyone of his Carpool Karaoke clips is an instant hit, and he's also found much success with his career retrospects, which audiences seem to love. This time, he puts Tom Cruise in the spotlight, and even brings on an unexpected guest which turned the audience into a mad house. Tom Cruise was on hand to take a look back at some of his most iconic movies. And he recreates some of the best and worst movies in his back catalogue at breakneck speed. The box office blockbusters are all accounted for, as are some of the bombs. But look out when they finally get to Jerry Maguire. It's a real show stopper. Tom Cruise and James Corden hit the ground running in this latest skit from The Late Late Show. They burn through 22 films in just over 9 minutes, which is no small feat by any means. This 'Role Call' may be the best one yet. And that's after Tom Hanks and Arnold Schwarzenegger both appeared on the show to also look back on their long ranging careers. Tom Cruise is currently on the press wagon. He's out and about promoting his latest action thriller, the sequel Jack Reacher 2: Never Go Back. It's in theaters this weekend. And while we predict it will do pretty good, it can't possibly top some of the classics that get recreated here. Whether you love or loathe Tom Cruise, you can't deny the man has made some memorable pieces of pop art and maybe even a true masterpiece or two. The films on the docket include Top Gun, Days of Thunder, Rain Man, Tropic Thunder, War of the Worlds, Minority Report, all five Mission: Impossibles, Born on the Fourth of July, Rock of Ages, Interview With the Vampire, A Few Good Men, Cocktail, The Last Samurai, Vanilla Sky, Jack Reacher, Edge of Tomorrow and Risky Business. But then, along comes a little movie called Jerry Maguire.